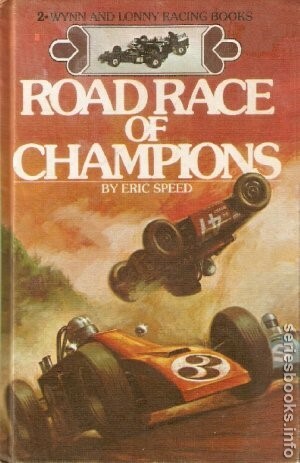 The last new series created by the Stratemeyer Syndicate, the six volume Wynn and Lonny Racing Books series was published by Grosset & Dunlap from 1975 to 1978 under the pseudonym Eric Speed. Authors: Sylvia Wilkerson (vols. 1,2,3,6) and Bill Fishburne (4,5) from outlines by Syndicate partner, Andrew Svenson. 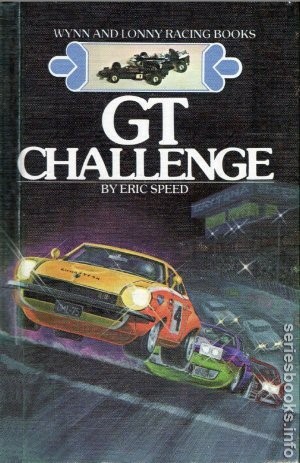 Both authors were racing enthusists and were reportedly paid $2000.00 per book. All six books were issued in picture cover (PC) format only. Plot synopses taken from the books. Wynn and Lonny, two North Carolina boys, save every penny they earn working in a garage in order to enroll in a racing-driver school in California. When they arrive, they find they have been tricked. There is no such school! But they do not return home. Instead, the boys land jobs in a drag shop as "gophers" and gain favor with their boss, a racing buff. 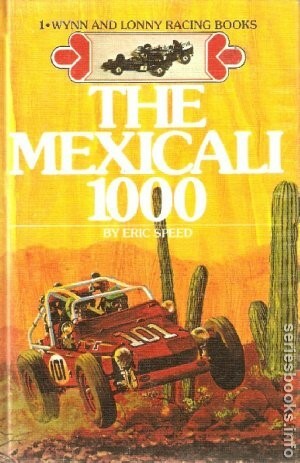 They hear about the Mexicali 1000, and, in their spare time, rebuild their buggy, Beetle Bomb, for the grueling off-road race down the Baja Peninsula of Southern California. During the exhausting race they realize that they have been unwittingly involved in an unscrupulous scheme of Mexico's two top smuggling gangs! Obstacles thrown in their way nearly cost Lonny's life and leave them stranded in the forbidding desert. Will their ingenuity and perseverance pay off? Read this hair-raising adventure and find out! Wynn and Lonny vow to become champions, build their own Formula Vee racer, and set out on the torturous trail of southern circuit competition. They start off well when novice Lonny wins a hillclimb and Wynn snares a sponsorship. But events suddenly take a sinister turn for the worse. First their sponsor pulls out, influenced by a rival's dirty trick, leaving the boys without travel money. The biggest worry, though, is a periodic malfunction of their car. It endangers Wynn's life and defies Lonny's mechanical ability. Encouraged, however, by their friends Inky Larsson and Nancy-Rae Eubanks, they race at Savannah, Talladega, Palm Beach, and Daytona, barely scraping together enough points to qualify for the gala Road Atlanta event. Their quest for victory takes a bizarre twist when the girls, suspecting sabotage, set out to investigate a strange series of mishaps. What happens after that, especially at the final Road Race of Champions, will provide racing buffs with never-to-be-forgotten thrills. Wynn and Lonny sell their Formula Vee racer and get a Datsun 260Z to enter GT competition. But disaster strikes when they learn they have bought a stolen car. They turn to their former sponsor, industrialist Jeff Kuralt, for help, only to find that he has a problem of his own. Someone is taking orders illegally for his new electronic gadget, the Altagem, which is not yet on the market. Jeff agrees to buy the 260Z from its rightful owner if they will watch for the swindlers. Then the boys enter the Camel GT Challenge and meet their old friends Inky Larsson and Nancy-Rae Eubanks, who plan to race in the Baby Grand. When they befriend Philip Harlan, an actor turned driver, there is more trouble. Harlan's ruthless enemies play one dirty trick after another to eliminate the handsome TV star from the tracks. Will they go so far as to attempt murder? It seems so, despite Wynn and Lonny's intervention. Read this exciting story about the dangers and adventures Wynn and Lonny encounter while their minds are set on one thing - winning the GT Challenge! 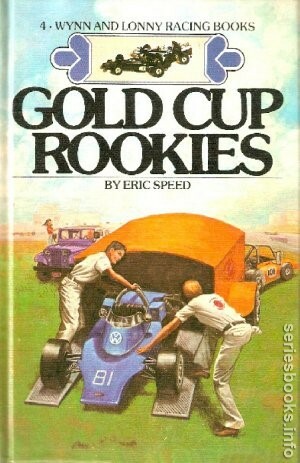 After selling their Datsun, Wynn and Lonny buy a new Zink Formula Super Vee and set out to race in the Gold Cup series. Competition is stiff, and an unknown enemy tries to sabotage their efforts. Jeff Kuralt, their sponsor, has invented an electronic device called the Altaguard and hopes for a contract with the Army. The boys try it on their racer, then take it to Aberdeen Proving Ground to demonstrate it to the Test and Evaluation Command. It fails! Jeff is about to lose his contract and must withdraw his sponsorship. The boys are shattered. How will they be able to race for the rest of the season? When an Arab sheik shows unusual interest in their car and the Altaguard, a chain of mysterious events erupts. Their friends Nancy-Rae and Inky are on an airplane that is hijacked by Arab guerillas. 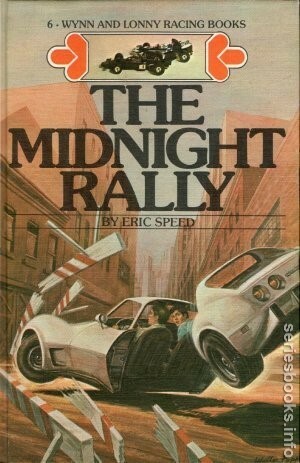 The Super Vee is damaged by an intruder at night, and Wynn is almost killed on the race track. Will they be able to beat the Swedish Super Star Sven Rosen? Don'	t miss the grand finale. It is breathtaking! In financial difficulty and lacking a sponsor for the season, Wynn and Lonny are forced to sell their Super Vee. Their luck changes, however, when they are introduced to a group of research chemists who are developing and testing a new synthetic motor oil. The U. S. military, which works with the group, provides the boys with two beefed-up Monzas especially built to use the synthetic oil and support Wynn and Lonny's races in the United States and at Le Mans, France, the world's most famous endurance race. The boys are elated. A life-long dream has finally come true. But their excitement soon turns to fear when they realize that someone is trying to terrorize and even kill them. 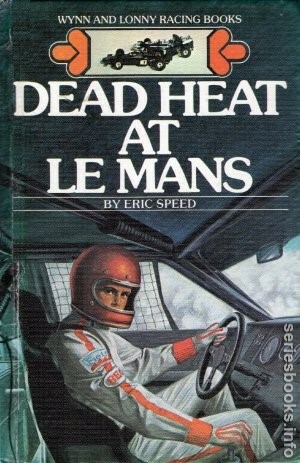 Then, to make matters worse, a member of their team is kidnapped and they receive an ultimatum: if they race at Le Mans, he will die! Must they abandon their plans in order to save his life? Though they are puzzled and worried, Wynn and Lonny work hard to reach their goals in the United States and abroad. Read this absorbing adventure and follow these brave and determined young racers through the most harrowing experiences of their lives. Wynn, Lonny, Inky, and Nancy-Rae are hired by a movie company to do the stunt work in a racing film. Before they leave New York with the motion- picture crew, a mysterious stranger asks them to take a small box to their destination in California for him. The boys smell a fish and refuse. From then on strange things begin to happen. While shooting on location in different states they discover they are being followed. Their camper is ransacked; their stunts are sabotaged; and they are almost killed. A disembodied voice warns them to leave the movie company. Who is behind these evil schemes? Wynn, Lonny, and their friends stay with the company and investigate in their spare time, finally exposing a cunning and dangerous gang of criminals.